Leaky basement may be causeed by a crack in the foundation wall of your house. If you have an older home, another reason for flooding in your basement may be an outdated waterproofing system or its absence altogether. Waterproofing can be done inside or outside. 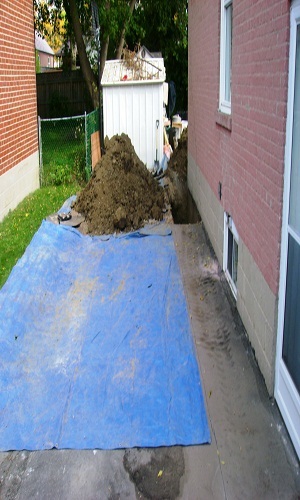 Toronto Drain & Plumbing performs both types of waterproofing services. We follow the National Plumbing Code and Building Code when waterproofing your home. We provide a 25-year warranty on our waterproofing services. A sump pump is a pump used to remove water that has accumulated in a water collecting sump pit, commonly found in the basement of homes. The water may enter via the perimeter drains of a basement waterproofing system, funneling into the pit or because of rain or natural ground water, if the basement is below the water table level. If you are a Toronto resident you may be eligible for a city grant to install a sump pump and/or backwater valve on your property in order to protect your basement from flooding. For more details, please visit the City of Toronto Basement Flooding Protection Subsidy Program website.